After going through the plant pictures for last year, I find I’ve completed pictures for 330 plants. This is deceptive. I’ve actually completed pictures for more plants, but don’t know what they are. This leaves me puzzling out beggar ticks among others. There are ten species listed for Dent county and two others possibly here. I have completed pictures for four or five of these. I don’t know which ones. 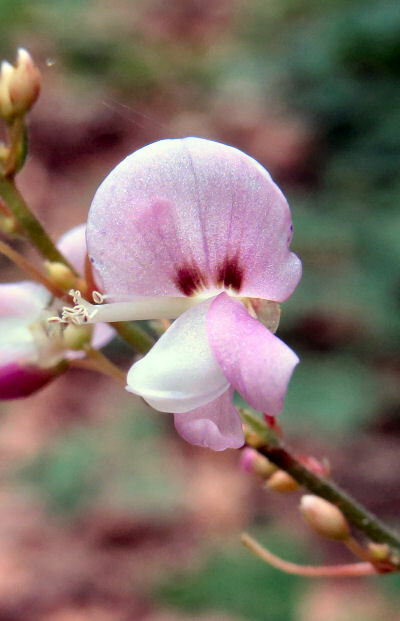 Many beggar tick plants are genus Desmodium. This plant is a bush. The flowers fit the regular plan. The seed pod is single, but looks like a beggar tick. How is that possible? 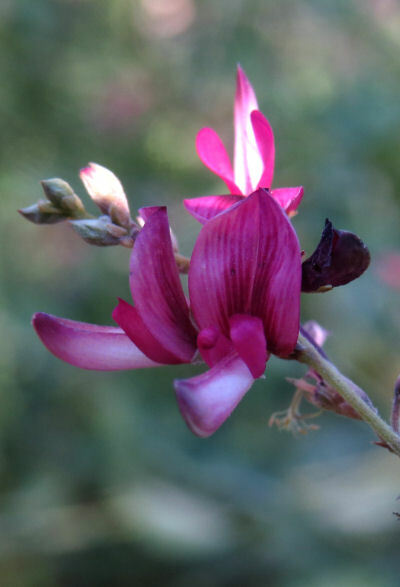 With beggar ticks, genus Desmodium, family Fabaceae, this is easy. The flowers look a lot alike. Many of the plants look a lot alike. Most flowers are a plum pink. They have two petals standing up and overlapping a bit or fused. These have greenish white teardrops at the base with a dark red purple border. The other petals form a slipper sticking out. This may be closed around the stamens and pistil. It might not be. One characteristic to look for. This is yet another variation on a beggar ticks flower. The white parts of the eyes are missing. The slipper is open. The flowers are scattered along the stalk. Surely this one will be easy to identify. If I keep looking. Flowers can be small and close together down a long stem. They can be larger and spaced out. Puzzling out which is which is difficult. The leaves are in sets of three leaflets. These can be long and narrow or short and round. They can be sharply pointed or have blunt tips. Some plants are a mix. The plants are often several stems from a central rootstock. At least one is a bush. Most beggar ticks flowers are some shade of pink. These are white. They are lining the flower stalk. They do have the little eyes at the base of the upright petals. 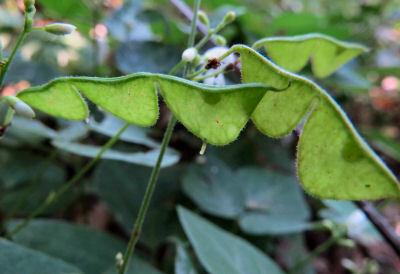 They should be in the genus Desmodium. Seed capsules referred to as beggar ticks are the other important item. Usually there are several seed capsules in a string. Usually these are covered with short, stiff hairs so the capsules stick to fur or clothing. Some strings are fewer than five, Some are more than five. This is often my problem. I get pictures of the plant, leaves and flowers, but don’t find the same plant to get pictures of the seed capsules. I’m left puzzling out beggar ticks missing a vital piece of information. There are keys. I work my way through them slowly referring to the glossary for terms and still taking a guess. Beggar ticks are larger than the small football shaped beggar lice. The flat pods are covered with short hairs and attach to passing fur or clothes immediately. The strings often break up as they are pulled off. Different kinds have slightly different shapes and numbers of pods in a row. There are pictures online. I take a notebook, look each one up and sketch the flowers, stems, leaves and seed capsules noting special characteristics. Once I have all of these done, I will work my way through my pictures. As the beggar ticks get going this year, I’m ready. I have marking tape. I will tag the plants I’m working on so I know which is which when I go back for seed capsule pictures. I’m tired of puzzling out which beggar ticks are which. 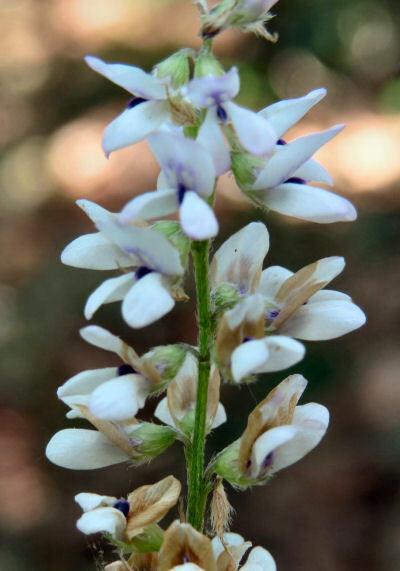 This entry was posted in Ozark Hills and tagged identifying plants, Ozarks plants on February 13, 2019 by [email protected].